3 bedroom, 2 bath home. Rate is based on 8 Guests and sleeps a maximum of 10 Guests. The Hot Tub is no longer Available with this rental. Southern Comfort is an extremely comfortable home, with granite counter tops in the kitchen, comfy living room furniture, a comfortable rear patio, oversized paver driveway, and vinyl fencing front and back. Open the front door and you`ll immediately feel at home. The kitchen has two eating areas for your group and 3 big bedrooms that will accommodate all your happy campers. Fit a few more on a trundle double bed and the living room’s sleeper sofa. There’s room for everyone, including your fur babies. 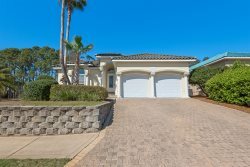 You will immediately notice the magnificent backyard, with the crystal clear pool, and completely fenced in yard, which makes it safe for the little ones and the pets. The back patio also allows mom and dad to sit in the shade while still keeping an eye on the little ones. With the beach just a few minutes’ walk (less than 2 blocks), this lifestyle is addictive. Use the included Wi-Fi to catch up on emails and send family and friends pictures of beautiful Destin. Perfect vacation home! Perfect location! Great memories! The first day we showed up Rick was there to meet us and handover the keys for the Golf cart. Man that guy was great. He made us feel at home. Very friendly. Wish he was my uncle so I could come visit more!! Six years of renting with Easy Street and not one single complaint about the homes or the management. When I walk in the door I feel like I have arrived at my "second home." Rick and Debbie, the property managers, have made the process of starting and finishing my stay at any of their properties a seamless, easy and pleasant experience. From the first day I arrive, until the day I leave, I know I don't have to worry about anything except relaxing and enjoying myself in one of their lovely homes! Thank you for providing a comfortable, clean home and fenced in backyard for me and my dogs to stay in over the past 6 years. I could not be any happier with the location, layout and comfort of the homes provided by Easy Street! Quick response to emails/texts. No issues during our stay so we didn't need to contact anyone while we were there. Super easy reservation system. Quick response to emails/texts. Happened to run into Rick by the beach one day, other than that we were in and out. Another great vacation with a really good rental company! We had an amazing experience. We needed to verify a few things and response was very quick! I loved the combination door lock! It made it so much easier to come and go and not worry with a key! The house had such a warm flow! It was a convenient walk to the beach, which was spectacular ! There was so much room that I didn't feel like I was bumping into the family! Such a beautiful, well maintained property. From the moment we walked in we felt like we were home! This house has a beautifully appointed kitchen and plenty of room to spread out and feel welcome. The layout was very convenient and allowed plenty of space for both privacy and family togetherness. It's a great place to stay--the beach is so clean and beautiful, and the pool is perfect for tanning or swimming. We hope to be back soon. Rick handled meeting us and delivering the golf cart we rented during our stay. He is a professional and was very pleasant to deal with. Southern Comfort suited our needs perfectly. It was clean and well appointed. You could call it a home away from home almost. We will be returning. Rick & Debbie are very friendly and will go above and beyond to make your stay at their vacation rental home unforgettable and absolutely enjoyable. They handled everything with the utmost importance and we enjoyed every minute of our stay. From the amazing backyard (hot tub, pool, screened in porch & beautiful yard) to the comfortable bedrooms & living room area, we enjoyed our stay to the absolute fullest. Rick & Debbie were great to work with and made everything easy and convenient. We truly enjoyed having our dog with us while on vacation and appreciate how understanding and pet friendly the owners are. We plan on staying here again in the near future. If you are looking for a great place to stay with all the amenities & a great fenced in backyard in a nice area, very close to the beach, look no further. You will not be disappointed. We highly recommend Southern Comfort! We loved "southern comfort" and will plan to stay again in the future! Working with easy street rentals was great! Our booking experience, check in and check out was a breeze! We love easy street vacation rentals!! We have stayed in many of their properties and have never been disappointed! Billy and Rick returned all emails and phone calls. Very easy to work with. Very personable. Housekeeper did such a great job I left her a tip! Southern Comfort is awesome! We appreciated the fact it was pet friendly and the doggy "potty area". The neighborhood was very quiet, no Spring Break loud party's. TVS in every area were wonderful with good picture. Everything was clean and there is great water pressure, plenty of towels and the entire cottage was spotless. We are already planning on coming back next year for a longer period of time. Pool was nice and warm and hottub was nice and hot. We spent lots of time in the hot tub watching our 12 year old swim. Landscaping is also nice. Big yard with privacy fence.